NFL defensive back who was selected in the fifth round of the 2015 draft by the New Orleans Saints. He played college football at the University of Georgia, where he was a second-team All-SEC member as a senior. When he enrolled at Georgia in 2011, he became the first member of his family to go to college. The team named him their Most Improved Player in 2012. He was a four-star recruit coming out of high school. In 2016, he was arrested in Athens, Georgia after being clocked driving 100 mph while passing a car on the freeway. He was born to Mona and Marlon Swann in Atlanta, Georgia. 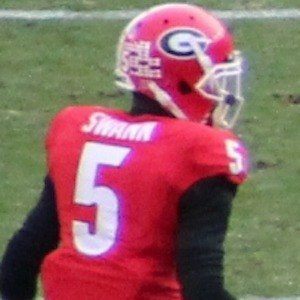 He and Jordan Jenkins were teammates at Georgia.